A seven-month-old baby died after suffocating on a nappy sack which he pulled through the railings of his cot, an inquest has heard. Maison Amison was found pale-faced by his mother Beth, 25, with the nappy disposal bag across his face on March 7 this year. His father Martyn attempted to revive him with CPR while Mrs Amison called the emergency services. Paramedics rushed to the couple’s home in Hendesford, Staffordshire, and tried to save Maison but he was pronounced dead at Stafford District Hospital at 9.30am. An inquest at Cannock Coroner’s Court heard yesterday how the child slept in a traditional wooden cot with spindles. Maison had limited mobility but would have been able to to fit his hand between the gaps in the spindles to reach a packet of nappy dispenser bags nearby, the court was told. South Staffordshire coroner Andrew Haighsaid he is now considering writing to the Government about whether the industry displays sufficient warnings on packaging. Giving the cause of death as ‘nappy sack syndrome’, the coroner said he would be making inquiries into what markings appeared on nappy sack packaging to alert parents to the dangers. Mr Haigh said: 'I am alarmed to find there have been other cases of nappy sack deaths. 'I will consider sending a report to the relevant government department if I find that warning signs are not prominent enough. Giving evidence Pathologist Dr Philip Cox, of Birmingham Women’s Hospital, who carried out the post-mortem examination, said Maison’s lungs were congested after his breathing had been blocked. There was no medical reason for his death but the findings were consistent with suffocation. Dr Cox said: 'The nappy was across his mouth and that probably constricted his breathing, causing fluid on the lungs. 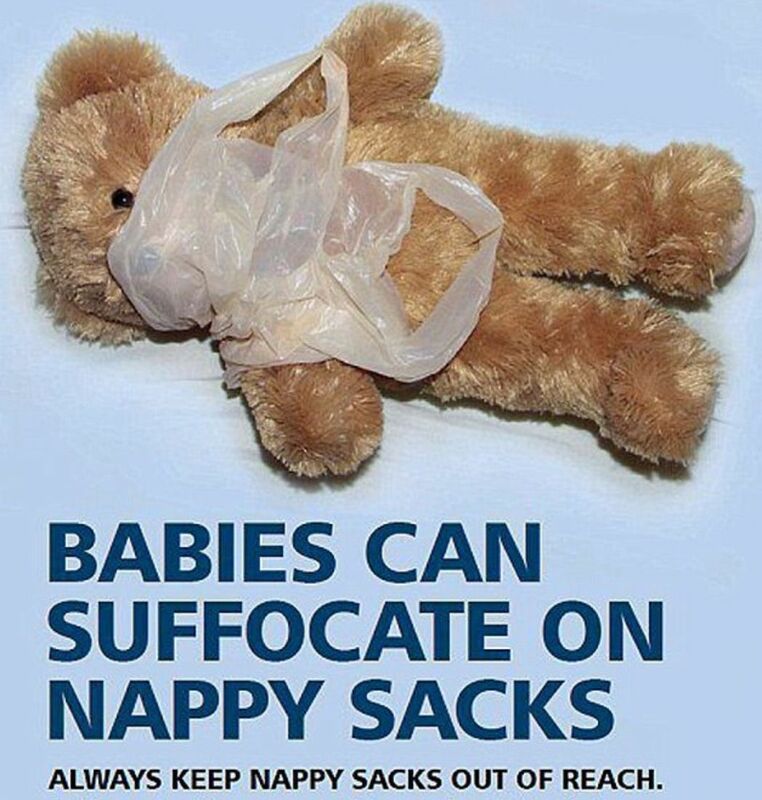 'I have seen other cases where babies have been suffocated with a nappy sack. Myself and a colleague have between us come across three previous cases in the last seven or eight years. 'The problem is that the sacks are light and very thin and, therefore, easy to inhale. Maison could easily have sucked it into his mouth and the bag would have conformed to the contours of his mouth. The NHS launched a nationwide campaign to alert parents last year after a similar case in Cornwall. Public Health teams across England and Wales were issued with a ‘toolkit’ with posters, an educational DVD and YouTube clip to explain the risks of nappy sacks. Doctors revealed infants have an automatic reflex to grab things within reach and bring them to their mouths. Nappy bags are made from thin plastic that can cling to a baby’s face. They are unable to pull them away again as their impulse is to go rigid. Speaking at the time Katrina Phillips, chief executive of the Child Accident Protection Trust, said: ‘Because nappy sacks are seen as an essential piece of parenting kit, parents don’t realise that they are as dangerous to babies as plastic bags are to small children. 'They are often kept nearby, within easy reach, for nappy changing. 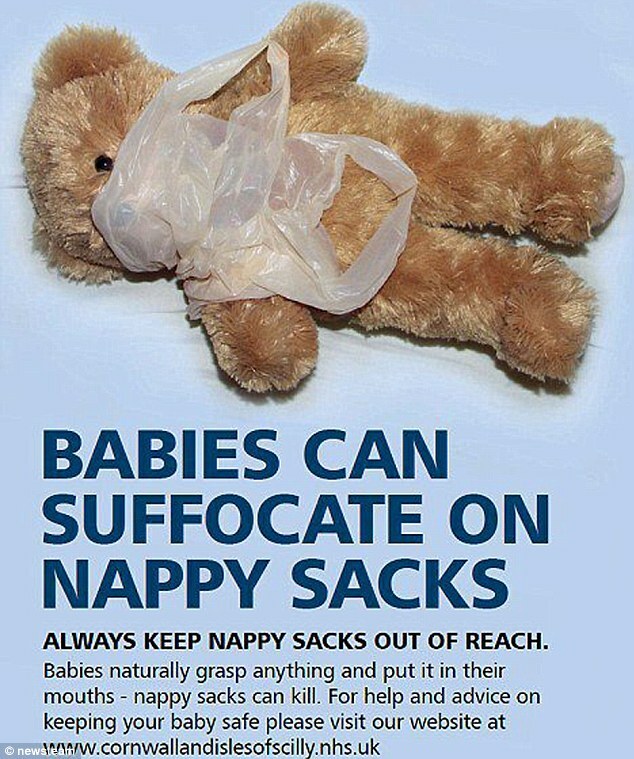 'This campaign will remind parents that nappy sacks need to be kept out of reach of babies, particularly in the bedroom. “Young babies are most at risk because they naturally grasp things and pull them to their mouths, but then find it difficult to let go.